Let’s start with publication of a soft state via SIP PUBLISH. It is the Presence Server (PS) which is storing the soft-state information and it is applying an originating service for the presentity. The AS association is created either during the Third Party Registration or technically it can be done even during the initial publication. Well, this was too easy. That’s because we don’t have any watcher yet. So let’s add a watcher. For the watcher the PS applies a terminating service. In order to make the things simpler Alan will be always presentity in our examples and Bonie will be the watcher. So Bonie subscribed to Alan. But usually Bonie doesn’t subscribe to Alan directly but via RLS as Alan is in her buddy-list. 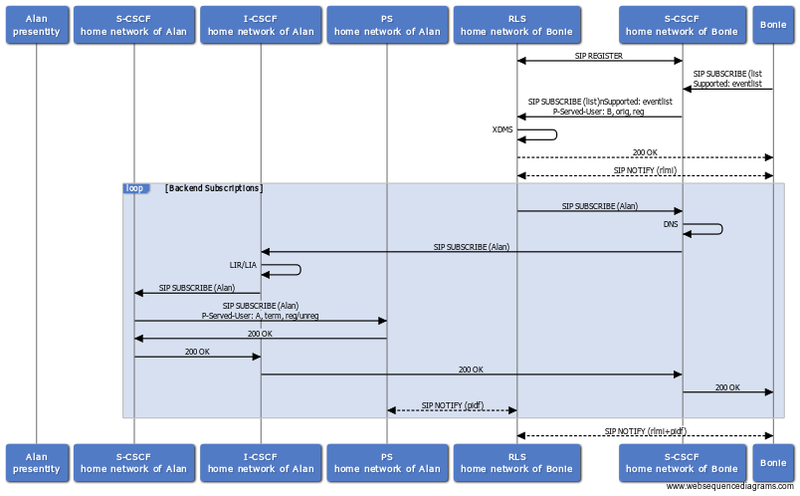 RLS is than applying an originating service for Alice. It also does communicate with her XDMS where Bonie stores her list and list rules. RLS will retrieve the list from XDMS and it will do back-end subscriptions to all the entries of the list. 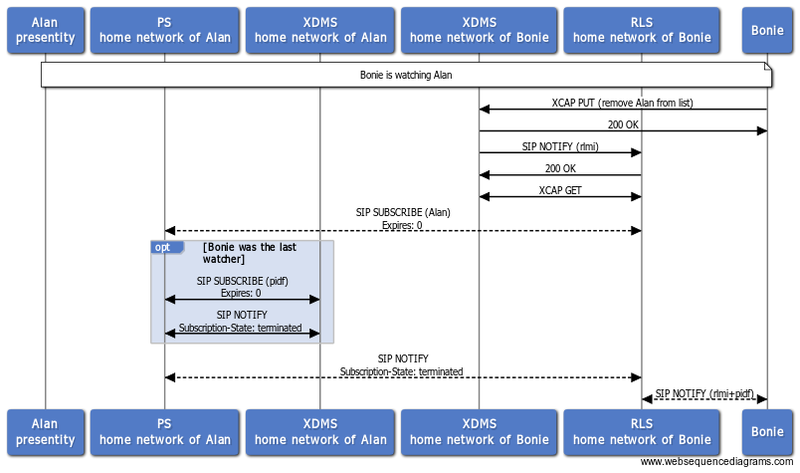 These back-end subscriptions are sent to PSs which apply terminating service and communicate with their XDMS. In our case with the XDMS of Alan, as he stores his hard state data and pres-rules there. 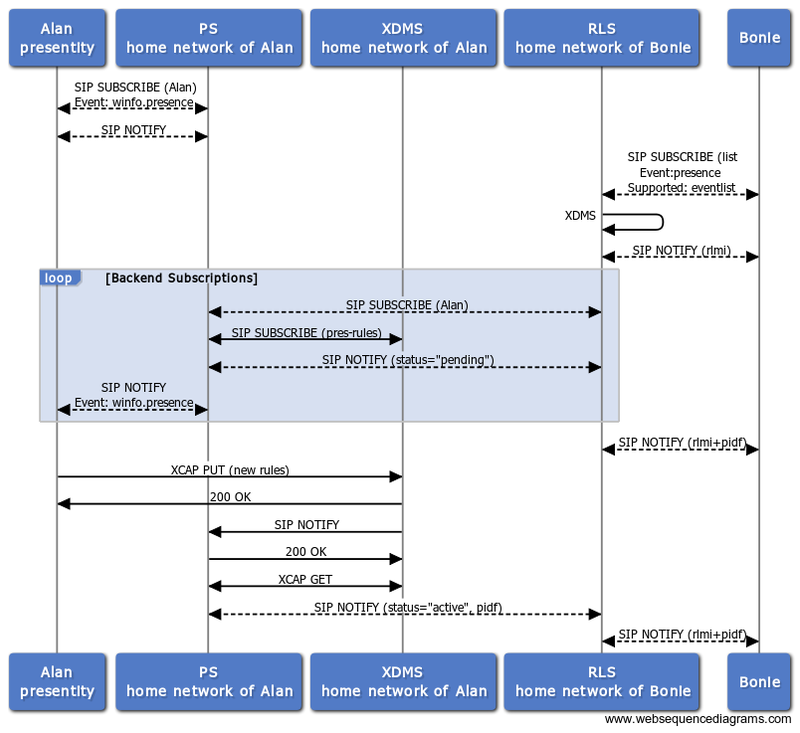 Now let’s show the same flow, in case that Alan is subscribed to his winfo package. The service is handled by his PS as an originating service. That means we can send SIP SUBSCRIBE to RLS and PS and PS can apply either originating or terminating service. 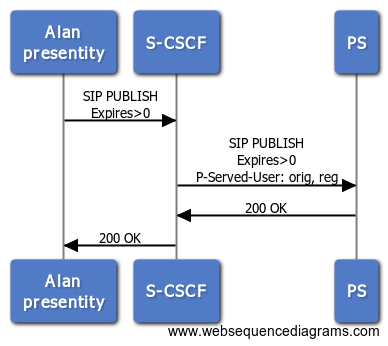 The main headers in the SIP message are Supported and Event. Based on these we can base our rules in IFCs. Plus the Subscription-State will indicate the reason (e.g. deactivated, rejected, timeout, etc.). For more information refer to RFC 3515 and RFC 6665. In case that Bonie will remove Alan from her buddy-list, RLS has to un-SUBSCRIBE from his presence. Similary Bonie receive the NOTIFY – terminated if Alan decides that Bonie is not allowed to watch his status. Last but not least, remember that if Alan un-PUBLISHes his state, Bonie (if allowed) still remains his watcher. That means the service is persistent even when one gets unregistered. This entry was posted in IMS, Presence, RCS and tagged pres-rules, presence, presence authorization. Bookmark the permalink.